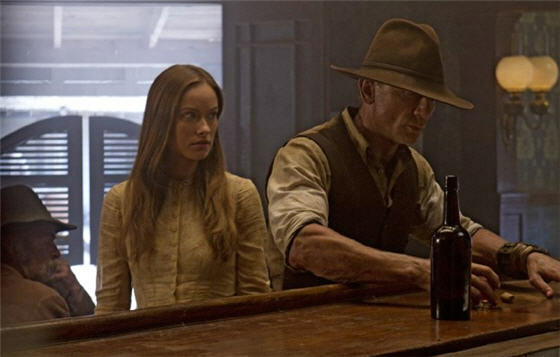 So I went into Cowboys and Aliens hoping for a 80/20 mix in that order, and this is just one of the things that Jon Favreau and the various writers get exactly right. Some reviews have criticised the movie for not subverting the genre, or doing anything to surprise the audience; I’d argue that there are some things that you not only expect but demand from a movie like this, and deep political statements are not one of them. There’s plenty of room elsewhere for profundity. This is not to say that it’s a deliberately stupid movie; the tone is pitched perfectly with a slight wink but never resorting to broad comedy, and the cliches are ticked off without being hammered home. And there are plenty of in-jokes for fans of both genres. Some irony-free critics have called it humourless, and it’s their loss. 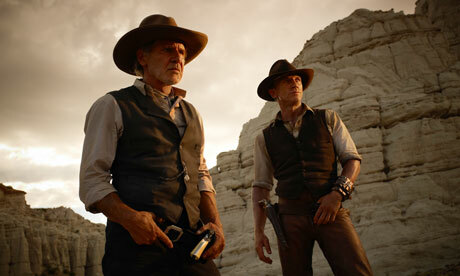 Daniel Craig is perfect as the monotone hero determined to make up for his past life and do the right thing. He looks like he’s made out of cowhide, and I found myself wishing that this was a genuine 100% western so we could see him in more punch-ups and shootouts. For the first third of the movie, the only concession to SF is the mysterious bracelet on Craig’s wrist, and the movie ambles along pleasingly, introducing a strong supporting cast: Olivia Wilde as the love interest, Clancy Brown as the local preacher/doctor with a nice line in wisecracks, Sam Rockwell as the bespectacled big city boy who can’t shoot, and Harrison Ford as the Gene Hackman character who rules the area despite the efforts of the honest sheriff Keith Carradine. When the aliens actually appear, their technology seems to be aligned to the time, full of gears and mechanical parts – of course this makes no sense but it looks nice. The aliens themselves owe a lot to Giger’s Alien design, except when they run, adopting a crab-like stance suited to fighting men on horseback. Thankfully the aliens are not the limp glowing Spielberg type, and want nothing else but to engage in a fight to the death, and the locals are equally glad to reciprocate. This idea seems to have offended a few critics, who seem determined to view this movie through their own preconceptions. They kidnap a bunch of townspeople and the stage is set (sorry) for the big showdown. Along the way, Craig remembers his past, Harrison Ford learns to be a better father and to respect the native American, and Rockwell learns to shoot at the exact moment it becomes necessary. And Walton Goggins turns up, always a plus.